Japan Farmers Markets: Off to Okayama! C-chan, Mita-san, and Takashi-san this past December. As this post comes up I'm off to Okaiyama to help at a friend's farm. We'll spend a couple days bike touring, as is our habit, and then off to help Mita-san get his spring fields off to a good start. I'm not sure what our tasks will be, but I have no doubt it's going to be fun, dirty, and that I'll be well sore by days end. And very happy. We will be part of a group of friends heading down to do his bidding, and we're quite excited. A few weeks later Mita-san came back to ask the farmers if he could help out. He was planning to return to his family farm to grow rice and maybe a few other things. He wanted to gain some experience growing organically and get a feel for the farm life. My farmers were delighted to say yes, and each day Mita-san joined us in the fields doing whatever task was at hand for the day. We planted daikon, thinned the seedlings, covered rows of kabu, and cleaned up the zucchini field. (He illustrated how the round variety make excellent bowling balls and we had a good laugh that fall morning.) He peppered the farmers with questions and they shared all they could about soil, plants, weather, materials, equipment, and seeds. They were as eager to teach as he was to learn, and under their tutelage he became a confident farmer. On his last night in Tokyo we gathered for a small feast at the farmer's house where we wished him well and expressed our sadness at his departure. We all liked him, and were eager to see him succeed. Since then we've heard tell of Mita-san's use of ducks to eat weeds in the fields, challenges with equipment, pesky monkeys, and enjoyed the taste of his homemade miso. He looked, for all intents and purposes, as though the farming life agreed with him when he returned for a visit this past December. The four of us gathered in the greenhouse to talk and laugh and catch-up on all our adventures. It was a wonderful way to end the year. 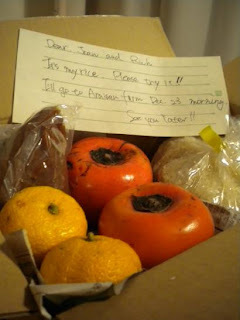 It really is our pleasure to be able to help, and I feel like it's the best thing I can do to help Japan's farmers gain some strength. 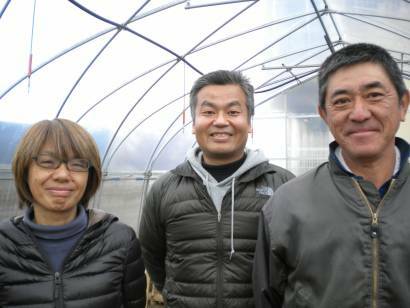 I know that's slightly absurd, but farmer's like Mita-san are desperately needed to rejuvenate a dying profession here, to grow organically, to revive rural economies and communities, and to warm the hearts of older farmers everywhere. It's the least I can do to lend a hand. Your trip is surely going to be wonderful and I look forward to reading more about it! What a great farm you are part of for so many reasons: the camaraderie, the learning, the sharing, the community. It sounds just fabulous. I just saw a person who used goats to 'cut the grass' and now I'm hearing about ducks eating weeds...how wonderful to use those natural things around us to keep things in balance! !